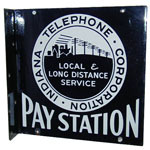 Use the links below, or browse signs by collector: Ell Bennett Ed Gerson Larry Larned Gerry Maira Brad Morrison Mark Redmond Steve Schack John Tipo Hui Tom Vaughn Jerry Williams Ekkehart Willms Got signs to add? or by company: AT&T Bell Canada C&P Tel. Cumberland Tel. 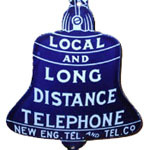 Mountain States New England Tel. New York Telephone Pacific Tel. 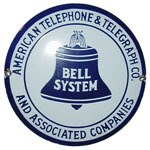 Southern Bell Southwestern Bell Wisconsin Tel. Got signs to add? Here's how.